From an early age, I had the understanding that there were four different kinds of ice cream: the traditional American style, called “Philadelphia”, which is made with milk, cream, sugar, and flavoring; “French”, which is a frozen egg custard; “Italian” (or gelato), made by the souffle method, with whipped egg whites; and “New York”, which has less egg than French. I can trace this rather simplified understanding to the early 1980s when my parents bought a White Mountain hand-cranked ice-cream freezer from Garden Way in South Burlington, Vermont. The freezer came with a book, Making Your Own Ice Cream, Ices & Sherbets by Phyllis Hobson (Garden Way Publishing, 1977), which sets out these four styles of ice cream with recipes for each (in vanilla, chocolate, and strawberry) — which I acquired from my parents about a year ago when they moved house. This book was published well before the rise of sorbet(to), frozen yogurt, and “super-premium” ice creams, which now make a large fraction of the overall frozen dessert category — never mind all of the modern technological frozen desserts made with ersatz dairy products like soy milk. What we had at that time was “normal” ice cream (in the three default flavors of vanilla, chocolate, and strawberry), lower-fat ice milk (made with little or no cream), sherbet (made with fruit juice and milk), and water ice. At a fancy restaurant, one might see a frozen mousse, but that wasn’t something you’d find in the freezer case at Martin’s or Grand Union. The Food and Drug Administration set standards for “ice cream”, “ice milk”, and something called “mellorine” (made with vegetable oil) which I have never seen. Looking at the table of contents of Hobson’s book, in addition to the four “standard” ice-cream styles I mentioned above, she also gives recipes for “marlow” (made with melted commercially-produced marshmallows), frozen custard, rennet ice cream, gelatin ice cream, frozen pudding, sherbets (both ice and milk varieties), and water ices. You can understand why some of these products have disappeared: there seems little reason to make marlow, given the relative costs of the ingredients, and the rise of vegetarianism has put paid to products containing gelatin or rennet (both made from animal carcasses). The scare over Salmonella in eggs means that few are likely to try Hobson’s version of “Italian” ice cream, depending as it does on an uncooked egg foam for some of its structure. The differences among the other products are quite subtle: “New York” style ice cream, according to Hobson, is an egg custard with gelatin added in place of some of the egg; “frozen custard” is an egg custard with additional thickening from cornstarch; and “frozen pudding” is ice milk made using canned evaporated milk. Meanwhile, other styles of frozen dessert, from semifreddo to sorbet to frozen mousses, are now well within range of the home cook — but there’s little agreement on what, exactly, defines the different types and styles. Many “ice cream cakes”, for example, are actually made with mousse, not ice cream, at least by some definitions. Nowhere is this disagreement more clear than in the case of gelato, which has largely replaced “Italian ice cream” in consumer consciousness. In looking around my own cookbook library for recipes, I found things titled “gelato” that varied all the way from a cornstarch-thickened ice milk to a true French-style egg custard; I’ll present the former later in this post. If there are any dairy ingredients at all, but no non-dairy fats are used, you have a sherbet (if fruit juice is also included), ice cream (if at least 15% butterfat), frozen yogurt (if stabilized by denatured dairy protein from lactic-acid fermentation of milk), or ice milk. If there are no dairy products, then you have ersatz ice cream (if made from dairy substitutes), water ice, or sorbet. 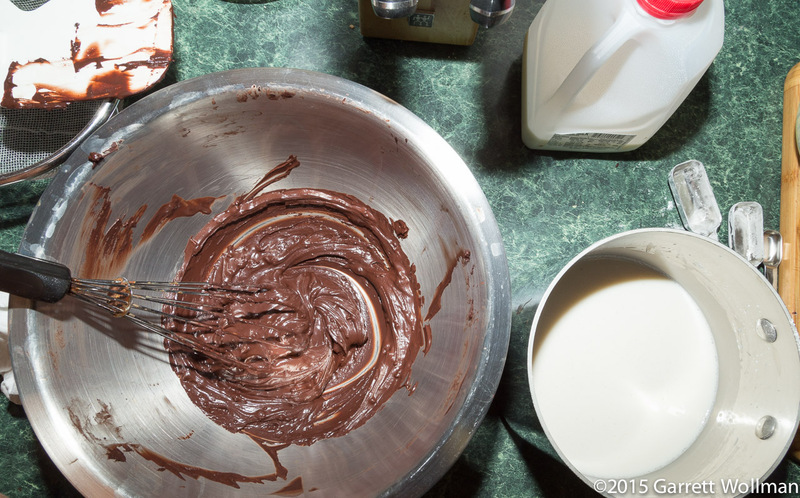 If cream is whipped and stabilized (with either gelatin or an egg-white foam) what you have is probably a mousse — although mousses can also be made from chocolate ganache; these are generally not agitated during freezing as is normal for an ice cream, and likewise semifreddo. Similarly, if there are no (real or fake) dairy ingredients and the product is not agitated continuously during freezing, then you have a water ice or (if stirred occasionally to prevent large crystals from forming) a granita. Generally speaking, all of the things we add to frozen desserts other than flavorings — and many of the flavorings as well — have a similar function: to prevent large crystals from forming, and thereby ensure a smooth, melt-in-the-mouth texture. Sugars, being hygroscopic, help to tie up water molecules to prevent crystallization entirely; likewise alcohols (both those we add for their own sake, like rum, and those we add as carriers for another flavor, as extracts and liqueurs). Starches and proteins are generally partially denatured, either by cooking (as in custards) or as a byproduct of fermentation (yogurt), to form a gel that, like sugar, holds water in place to prevent crystallization; the food industry and vegans use vegetable gums as alternatives to dairy and egg proteins (industry does so because they’re cheaper and easier to store in bulk). Added fats (including those mysterious food-industry ingredients “mono- and diglycerides” — normal fats are triglycerides) also help to control the melting rate and overall mouth feel of the product; a higher-melting-point fat like cocoa butter may be counterbalanced by lower-melting fats and oils to create a product that melts slowly at room temperature but quickly at body temperature. Did I overpromise? Perhaps, but I hope you found this discussion interesting anyway. Meanwhile, on to today’s recipe. 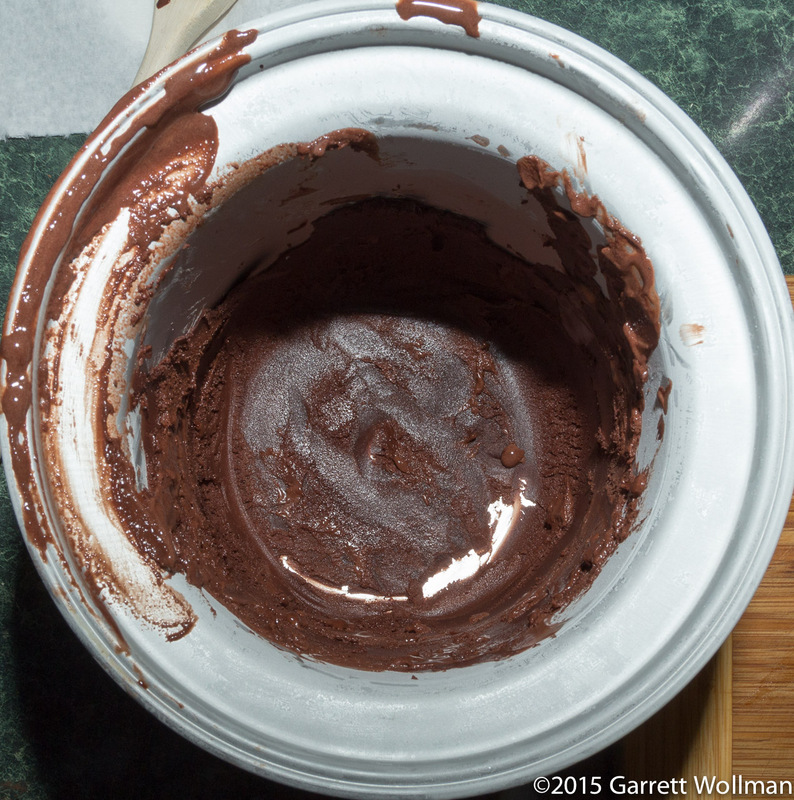 The parts list is extraordinarily simple: three cups of whole milk, 70 g of cocoa powder (I used Valrhona, which is alkalized, because it was most convenient to hand), 135 g of granulated sugar, 1½ tbl of cornstarch, and ½ tsp of salt. The cocoa (only) goes in one bowl (you’ll see below that I swapped this Pyrex bowl out for a different one) and the other dry ingredients go into a saucepan. 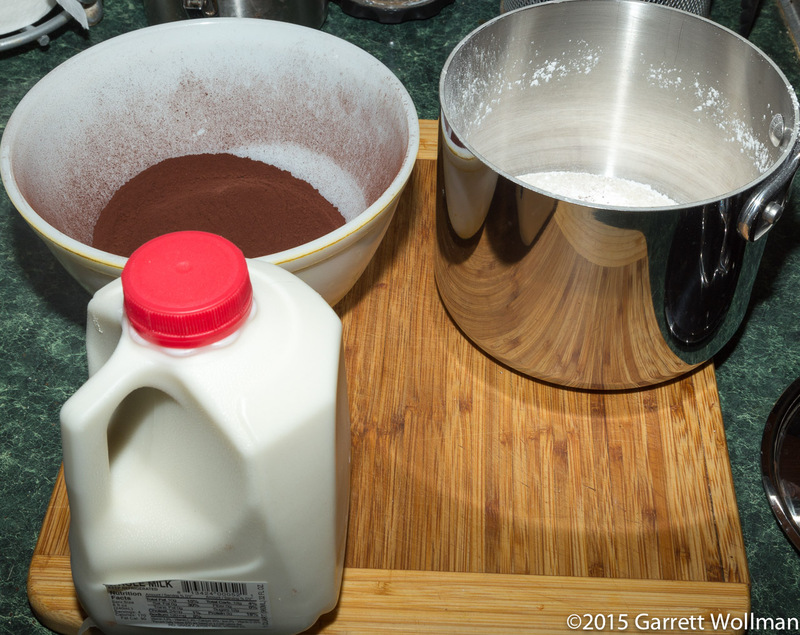 The next step in the process is to add just enough of the milk to both vessels to form a paste. The remaining milk is then whisked into the sugar-starch paste and simmered over medium heat until it reaches the consistency of a thin pudding. 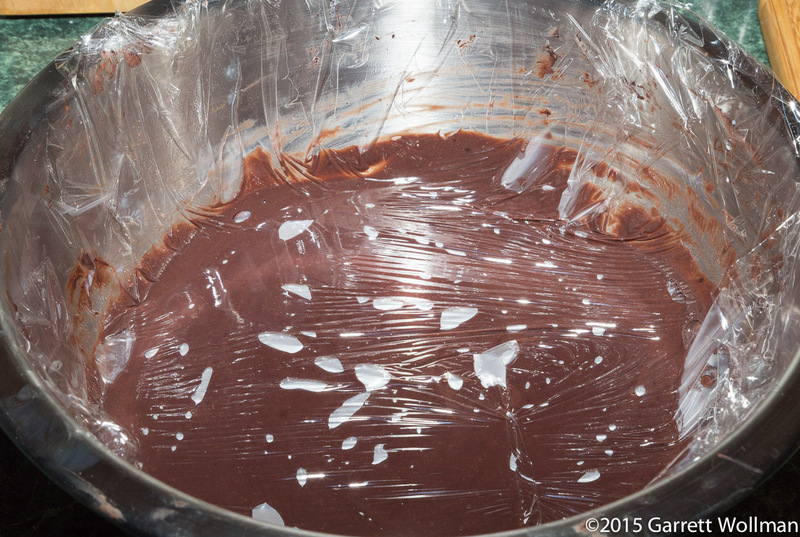 The thickened milk mixture is then poured over the cocoa paste and whisked thoroughly to combine, then allowed to cool. 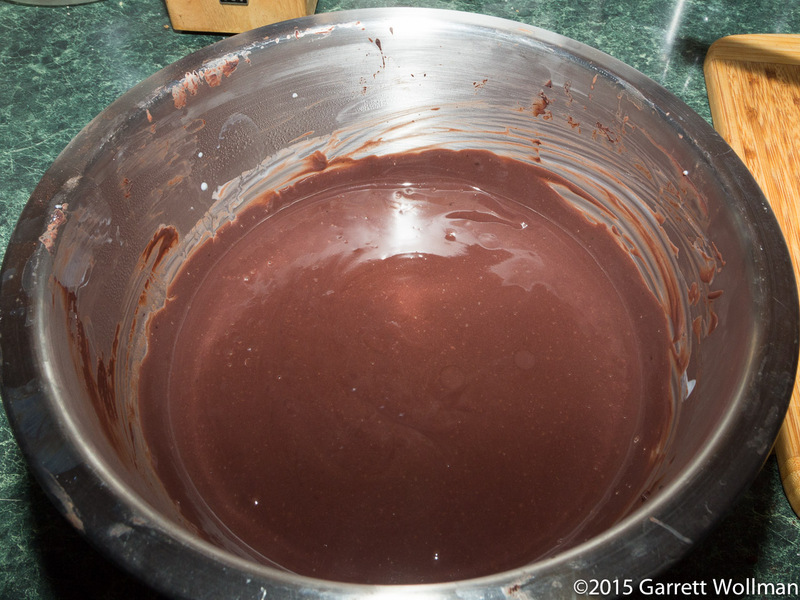 Medrich cautions that this base, since it is already fairly thick, should be churned for less than the usual time. My machine’s instructions say 20–25 minutes, so I cut it back to 15 minutes, and the result was this lovely product with the consistency of soft-serve. One puzzle, however, was what happened to the rest of my gelato. 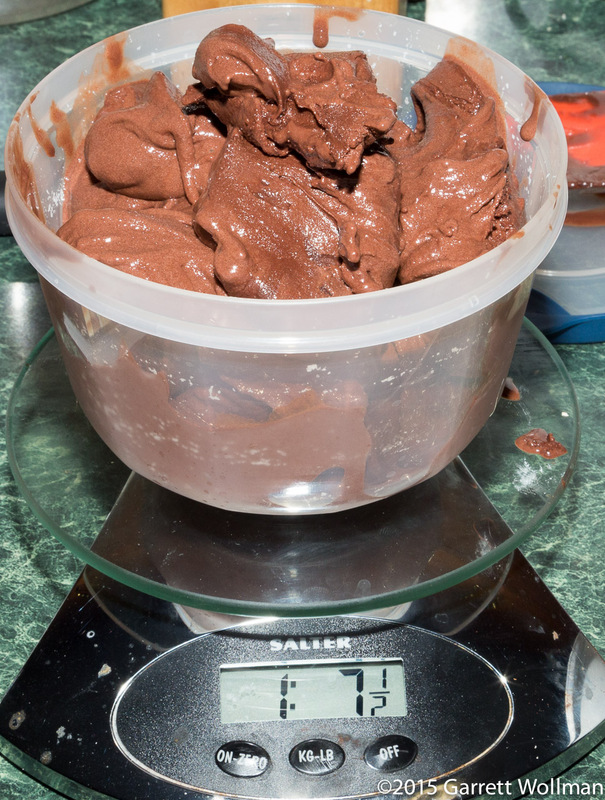 As you can see clearly on the scale display, there’s only 1½ lb of gelato here, but yet I indubitably started with 2 lb of ingredients. (Go ahead, add them up based on the quantities I gave above; you can assume that the specific gravity of whole milk is close enough to unity.) OK, some might have been left stuck to the saucepan (maybe an ounce? ), and I tried a tablespoon or two last night before refrigerating it, and some must have been left in the bowl or stuck to the plastic film (another ounce), but a whole half-pound? This entry was posted in Food and tagged Alice Medrich, dairy products, dessert, frozen yogurt, gelato, ice cream, ice milk, milk, mousse, recipe, sorbet, taxonomy. Bookmark the permalink.